Life on the road for RVers can be thrilling and memorable, but it’s not without its challenges as well. Although modern RVs are designed to provide the creature comforts of home, you have to adapt yourself to living in smaller quarters with different appliances than usual. One element that most RVers can struggle with is cooking. Not all RVs come with a full suite of options, including an oven, meaning that you have to be a little creative with how you prepare your next meal. Today we’re going to be looking at the best RV ovens, including what components to pay attention to most and the type of oven you should be using inside your rig. Overall, you can still create world-class meals in your mobile home, but you do have to adjust according to the type of RV you have. Let’s see what these ovens have to offer. When choosing the best RV oven, one of the most crucial decisions you’ll have to make is whether your new appliance runs on electricity or propane. While there are pros and cons to both options, electric ovens are usually a little more convenient and easy to master. With that in mind, let’s take a look at what this oven can do for you. Although cooking with an oven comes in handy all the time, in many cases, you merely need a stove to prepare your next meal. If that’s the case, this particular model comes with two hot plates on the surface of the machine. Unfortunately, these plates only have one heat setting, so you will have to accommodate your cooking times and measurements accordingly. However, to help offer some differentiation, one of the burners is 1000 watts, and the other is 600. Because this is an electric model, you have to pay attention to the wattage rating to know how well it can cook. Compared to other convection ovens, 1400 watts is more than sufficient for most RVers. With this kind of power, you can quickly make many different dishes in both the oven and on the hot plates. However, because it does use a lot of juice, you have to make sure that you’re plugged into shore power before using it. In many cases, RVers travel either solo or as a pair. However, if you have your family in tow, then you’ll need an oven that can accommodate all of you. Fortunately, this unit can fit a whole chicken inside, so you shouldn’t have any trouble making enough food for everyone. I appreciate the ease and simplicity of this oven. I like convection cooking because it’s faster and more efficient, and this countertop model works in most RVs without any problems. I also like that the controls are easy to figure out and that this is a breeze to clean. One downside of using an electric oven is that you have to plug into shore power, so it’s not just an issue with this particular model. That being said, I also don’t like the fact that you can’t adjust the heat settings for the hot plates, as that can make it much harder to cook until you master them. One element that will dictate the kind of oven you buy is the size of your RV. While most massive Class A models will come with an oven already, many smaller campers don’t. In those cases, you will want something like this unit from Cuisinart. Let’s see what it can do. One of the best features of this oven is that it can fit into almost any RV kitchen. If you are traveling in a camper van or travel trailer, then you’ll appreciate the fact that you can still make excellent meals without having to take over the whole interior space. Fortunately, even with its compact size, the inside space for this oven is sufficient enough for most meals. You won’t be able to cook for four comfortably, but if space is tight, then you probably aren’t traveling with that many people anyway. At first glance, the cooking possibilities with this oven seem extremely limited. Fortunately, though, it does come with accessories so that you have options when preparing your next meal. You can bake items inside this oven, as well as broil and roast food easily. To help you get the most out of this oven, it comes with a recipe booklet as well. If space is tight in your RV, then this is an excellent choice. Also, because of its compact size, you can use it in tandem with your RV’s built-in oven if you like. 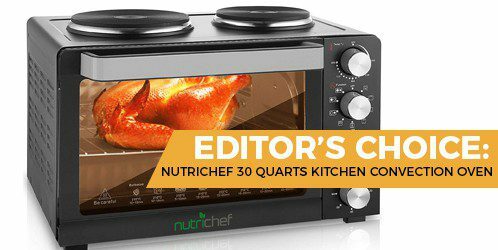 This particular model is so easy to use that it may be handier than a bulky cabinet oven, even if you have room to stretch your legs while cooking. Although this oven does come with baking accessories, I don’t recommend using it for that. The inside doesn’t create ideal conditions for baking, so most of your dishes won’t come out right. Although there are plenty of benefits to using an electric oven in your RV, sometimes the best option is propane. This model from Atwood is a perfect example of an oven that will help you make the most out of your next adventure. For the most part, if you’re going to have an oven in your RV, it’s usually best to have it installed into the cabinets. While this process is not always necessary, it will ensure that you can maximize your space and cook without using valuable counter real estate. That being said, be sure to measure out both your RV and this oven to ensure that it will fit. Fortunately, this particular model comes in two sizes (17 and 21 inches), so you can choose the one that works best. If you travel with your family most of the time, then you will love the size of this oven. You will also appreciate that it comes with three adjustable burners that help you make the most of this appliance. It’s never been easier to cook your next meal. If propane is the best option for your RV, then you can’t go wrong with this model, assuming that it fits into your cabinet space. I like that it comes with three burners and that it has more than enough room to cook meals both large and small. This is an all-around excellent choice. Overall, there’s not much to dislike about this oven, as long as you make sure that it will fit. Also, in some rare cases, it can get damaged in transit, but usually you can exchange it without any problems. In some cases, having an oven inside your RV is not feasible. For those situations, it may be better to get a camping oven/stove combination like this one from Camp Chef. Let’s see how it can enhance your life on the road. If you like to RV in campgrounds and other outdoor spaces, then you will appreciate this oven as it enables you to cook wherever you are. Although it can sometimes be inconvenient (i.e., when the weather makes cooking outside impossible, this style is very accommodating for those RVers who like to rough it. The other benefit of having it be outdoors is that you can use a larger gas tank if necessary. This way, you can cook to your heart’s content without worrying about running out of fuel. Because this is a propane oven, you get a lot more heat than if you used an electric model. When talking about the top burners, they can produce up to 7500 BTUs, and the oven itself can do up to 3000 BTUs per hour. Overall, you never have to worry about losing heat with this model. Assuming that cooking outside is an option for you, then this is an excellent choice. I like the size, efficiency, and cooking capacity of this model. I also appreciate that most of the surfaces are nonstick so that cleanup is a breeze. It can be annoying to set up and tear down your stove and oven every time you want to cook, so I highly recommend keeping it set up outside so that it’s always ready to go. Obviously, if you’re on the road a lot or you’re not in a campground, this oven is mostly worthless since you can’t use it inside your RV. Can a household oven be used in an RV? Simply put, no, it cannot. Because household ovens use a lot of resources (either natural gas or electricity), they are much too powerful for a mobile home. If you were to put a household oven into your RV, then it would cause more problems than it solves. The other reason these ovens don’t work in motorhomes is that they are often too big, and they require hookups that RVs cannot provide. What does this unit run on, electric or propane? The most crucial decision you’ll make when choosing the best RV oven is whether it uses electricity or propane. Here is a breakdown of what you can expect from both options. The benefit of this oven type is that you can cook at all times, even when boondocking. That being said, make sure that you always have enough fuel for your next meal. The downside to propane is that it can make your RV a sweat lodge rather quickly, and you have to make sure that it’s well ventilated, lest you pass out from propane fumes. One of the best reasons to get an electric oven is that you have more control over the temperature of the oven and burners. However, it will drain your RV batteries almost immediately, so you do have to plug into shore power if you go this route. If that’s not a problem for you, then electric is usually better. Is the RV oven needs to sit on a countertop or if it will be added to a built-in cabinet? Another element to consider when buying an oven for your RV is whether it will be installed or be mobile. Countertop ovens are perfect if the installation is going to be a hassle, but since the economy of space is always a concern with RVs, cabinet models are often the best choice, if they can fit well. Assuming that propane isn’t your go-to option for cooking in your RV, then I will highly recommend the NutriChef 30 oven as my top choice. I love the size, efficiency, and ease of use of this oven, and I think that it will add immense value to anyone who buys it. Convection cooking is ideal for life on the road, and you will be able to prepare all kinds of meals in this machine. You’ll also appreciate the durability and fast cooking times, as it will enable you to get creative when making different dishes. Overall, this is an excellent oven for RVing, whether you do it full-time or seasonally.